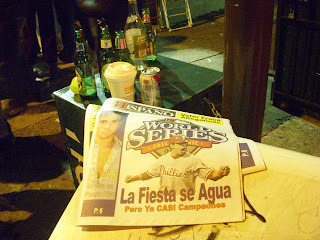 With all the media coverage of the Phillies World Series Win of 2008, there's not much need for me to recap what happened. The Drought is Over! No more Reign Delay! WE WIN! As to be expected, South Philly erupted into a frenzy all along Broad Street. I've nearly lost my voice from yelling and screaming and running around in the cold, cheering along with thousands of other crazed Phans. 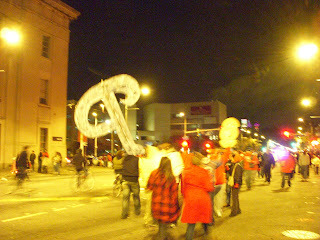 It was an amazing fun time, and the amount of people swarming along Broad Street, surfing on the tops of cars, climbing light poles and otherwise dancing in the streets was a sight to behold. Back in 1980, I was all of 13, too young and not living in South Philly to enjoy the impromptu parade. 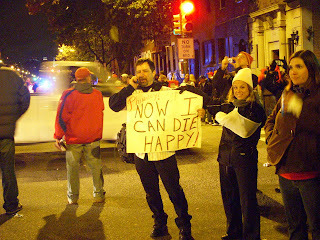 In 1993, the Phillies didn't clinch the title, so our parade was delayed for the next 15 years. I had to experience the rush first hand. My neighbors, Fabrizio and Michele, their dog, Esmeralda, and I headed up to Broad and Mifflin. Later, Liz met up with us and the four of us watched in amazement and bit of shock as people packed cars 10 or more full, spilling out of windows and doors. Some sights were funny, others were scary, such as watching young kids stomp on top of cars and on occasion, break car windows. We witnessed people climbing onto the backs of pick-up trucks, dragging down the back of the cab. 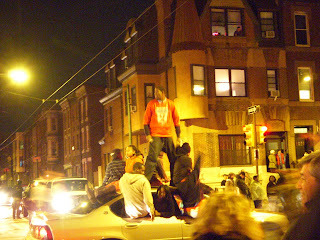 A flat-bed tow truck had the misfortune to get stopped at Broad and Mifflin; within seconds, people were flying onto the back of it, turning it's empty cargo area into a silver surfing platform. 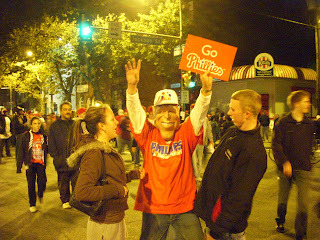 Stilt walkers, giant billboard sized Phillies "P", a man in Joe Biden Mask; Silly String squirting all over. It felt like New Years' Rockin' Eve! I can only imagine what the real parade will be like on Friday. Until then, enjoy the photos and video. I'm sure I'll have more to come!